Exquisite harmonies, rollicking rhythms, soul-spelunking songs .... An expansive journey across vast landscapes of the heart, and rich wildernesses of imagination, where hope meets possibility. From soothing ballads to powerfully polyrhythmic tunes; from laughter to soul stirring inspiration. With daring harmonies, and a mix of homemade "re-percussion" and conventional instruments (guitar, bass, marimba), all are invited to a realm of expanding boundaries, wonder, and life-affirming embrace. Click on the Look+Listen tab above for audio and video. Concerts: shows occur at festivals, theaters, clubs, universities, schools, synagogues, churches, conferences and retreat centers. Workshops: master classes in our particular brand of style-blending, genre-bending funky folk music, and multi-voice harmony, as well as creating and playing non-traditional percussion. For more detailed information please contact Loyd Artists booking agency (Susan@LoydArtists.com, 518-647-5916). and to see these two things as inseparable pathways to joy." Throw out the rules when the Billy Jonas Band takes the stage! It's a musical conversation, a sonic celebration, a splendiferous gathering of old and young, because the ensemble is ... EVERYONE. From beginning to end, participation is the name of the game. Across North America and beyond, with multi-part vocal harmonies, guitar, industrial re-percussion, bass, marimba, and audience-engaging choreography. 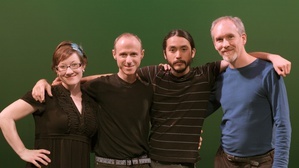 Featuring Billy, Ashley Jo Farmer, Sherman Hoover, and Juan Holladay. The Billy Jonas Band was honored with a 2010 concert at the White House! Billy Jonas has been part of the Sacred Music Team and a cantorial soloist at Congregation Beth Ha Tephila in Asheville, NC since 2012. Through this work Billy has had the opportunity to combine and grow two important aspects of his life: Judaism and his love for music. He has been performing worldwide in both secular and faith-oriented contexts. Billy Jonas, with the Billy Jonas Band, brings his energetic and engaging brand of participatory folk music to a new level of sonic sophistication in his symphony collaborations. Augmenting Jonas’ multi-textured homemade "re-percussion," the orchestra, paired with Jonas’ songs and stories, gives a performance that is exciting both visually and aurally. Jonas is known for his ability to bring the audience fully into the performance through his accessible songs and leadership from the stage, creating an artistically adventurous atmosphere enjoyed by all ages. "Having worked with pop stars George Benson, Linda Ronstadt and Judy Collins, I can honestly say that Billy Jonas is a first class performer. His music is compelling, humorous, beautiful and brilliant! Our orchestral fusion concert with him was the highlight of our season." With 22 symphonic scores to choose from, Billy Jonas’ orchestral programs explore exciting new arrangements of Billy's songs, as well as bring new life to altered arrangements of Bach's "Jesu Joy" and Ravel's "Bolero," each performed with new, original lyrics composed and performed by Billy. Throughout all of the shows, audience members will be asked to variously sing-along, percuss-along, move-along (with choreographed hand-motions), and for the finale, kazoo-along with the Billy Jonas Band and the orchestra. Concerts offer plenty of room to personalize the show with antics, unique homemade instruments, added voices and dance. quickly establishes a rapport across all ages. An extreme pleasure to have him!" In addition to traditional venues, Billy Jonas & the BJB occasionally present concerts in people's homes. For some, it's the chance of a lifetime -- up close and personal with your favorite musicians and music. The intimate, relaxed and interactive experience of such a gathering is one that will never be forgotten! How does a 'House Concert' work? House Concerts are focused, seated, listening events -- very different than a party with live music. They usually occur in a large living room, or nearby private space such as a recreation room/commons of an apartment complex, studio, social hall, comfy barn, or private backyard. House Concerts are mostly (though not always) acoustic, and typically have 30 to 80 people depending on the space. Often they involve a potluck. Sometimes they are public, sometimes by invite only. People expect to pay to attend (unless the host has covered it), and to sit and listen. House concerts are a wonderful way to spend time with the artists, as well as to meet neighbors and folks with like-minded interests. There are as many variations on the theme as there are people hosting them! 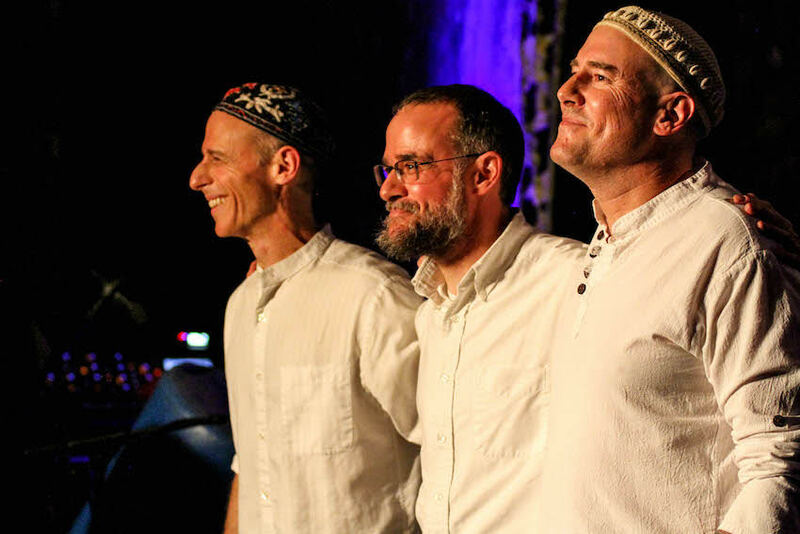 Billy and the Billy Jonas Band LOVE working with different faith communities, especially when it involves more than one religiion at the same time. Their songs are born out of a deep reverence for all expressions of spirituality. They seek to enhance whatever gathering or worship context has invited them, and their programs are tailored to the specific needs and demographics of those present. At the core of each and every event: an acknowledgement of the beauty and wisdom in each separate path, and a celebration of the Oneness connecting them all. "A Muslim, a Christian and a Jew walk into a concert hall...." For real! Abraham Jam is the brainchild of singer/songwriter and peace activist David LaMotte. Since 2015 Billy has been a member, dedicated to fostering dialogue, understanding, and celebration among folks from the three "Abrahamic" faiths. Each concert and/or workshop features a trio consisting of professional musicians from each tradition. Instead of alternating in the sharing of their songs, they participate in making music together, embodying their respect and affection for each other, rather than just talking about it. Members of Abraham Jam have included Dawud Wharnsby, Dan Nichols, David LaMotte, and Billy. Check out the Abraham Jam website at: http://abrahamjam.com. For more detailed information contact susan@loydartists.com.